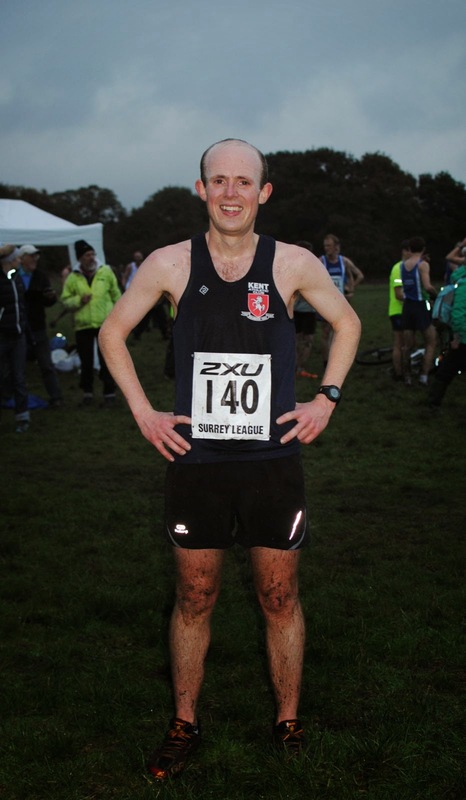 On Saturday I took part in the second Surrey League Cross Country fixture of the season at Mitcham. It rained all morning and the weather wasn't looking to promising for an afternoon jog in the park, but thankfully the rain eased as I took my first trip on London's tram route out to Mitcham for the race. The league is taken pretty seriously. Most of the team had got there close to an hour before the race and had been out on the course to do a recce and warm up. However, I was taking a pretty relaxed approach. My legs are still feeling heavy from the marathon three weeks ago and I'm not doing much training at the moment. It is also only the ten fastest runners from each club who score points and I reasoned I'd be comfortably outside the quickest ten. With five minutes to do I decided I probably should do a quick warm up and then it was off to the start. The course was pretty narrow which led to a funnelling of runners and I got a couple of shoves from a guy on my left. I don't enjoy the pushing and shoving and resisted the rude man to my left on principle but lost a few places to others as I got boxed in. I was trying to keep up with good running friend Rich who is a similar standard to me. He made a better fist of the start and was five to ten places ahead. My legs weren't feeling too bad, but I was wishing I'd taken my pre-race lunch a bit more seriously as I could feel it sitting heavily sitting in my stomach. I was managing to keep Rich in sight and managed to close up a few places as we progressed through the first part of the lap. It was a pretty technical course and a recce would have been a good idea. There was an unsighted ditch, a few really large divots which made me stumble and some steep hills and descents. Towards the end of the first lap I managed to catch Rich and was sitting on his shoulder. As we started the second lap Rich seemed to slow and I was feeling ok and decided to try and keep my pace and overtook him. Just up the road was another club member Luke, who I have never beaten in a race before. During the second lap I managed to draw level and then also pass Luke. Further up the course was Lawrence, another club member, who is never normally in sight but there he was. Was I in a lot better nick than I thought? Or were they just having bad days? As we started the last lap I was beginning to feel tired, although my legs were still feeling ok. I resisted looking at my watch and tried to keep pushing. My form was dreadful up the hills, but I kept going at a decent pace and managed to overtake a couple of people. As we entered the last kilometer I was overtaken by five people in quick succession, but they were all finishing a lot stronger than I was and there was no way that I could have kicked that far from home. With a couple of hundred meters to go I decided the time was right to kick and managed to pick up a couple of places on the run into the line. I almost got a third runner on the line, but he managed to stay ahead of me. I was pretty pleased with my run. My legs felt a lot better than I expected and I managed to beat a couple of people from the club that usually have the edge on me. John, who came second in the London Marathon this year, congratulated me on my run after the finish and shook my hand. Proud times. I'm very grateful to Becks who came to support me on the day. I was the only club member with a fan club which I was very appreciative of. I came 74th out of 193 finishers in 32mins and 50seconds. An average pace of 3min 46sec per km.